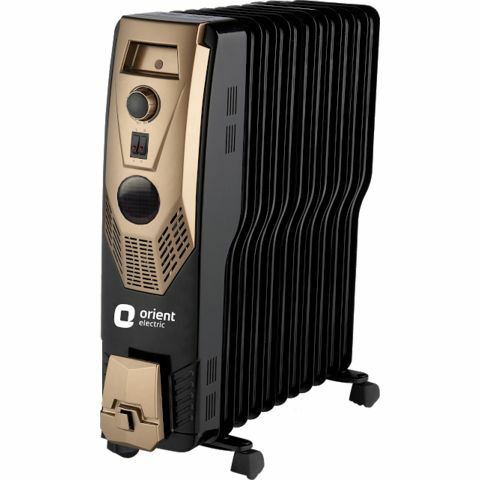 Presenting Orient Electric exclusive range of Oil Filled Room Heaters with superior technology designed to keep you warm even in chilling winters with an additional heater for quick heating. It deserves its place in your home purely due to its good looks and smart performance. Equipped with a 24 hour timer, this room heater will surely make you forget that you are in the middle of a harsh winter. Presenting Orient Electric exclusive range of Oil Filled Room Heaters with superior technology designed to keep you warm even in chilling winters with an additional heater for quick heating. It deserves its place in your home purely due to its good looks and smart performance. Equipped with a 24 hour timer, this room heater will surely make you forget that you are in the middle of a harsh winter.